The BCN joins the call sent out by the Mar y Sol restaurant to the townspeople living in this traditional Riviera Nayarit village encouraging them to enlist in the cleanup effort. The 37th event in the third year of the Beach Cleanup Network (BCN) will take place on Saturday, July 8, when the citizens of Bucerías will join up to clear out the El Indio stream. This is a much-needed action in light of the ongoing rainy season. The BCN joins the call sent out by the Mar y Sol restaurant to the townspeople living in this traditional Riviera Nayarit village encouraging them to enlist in the cleanup effort, as the current storms cause the stream to carry a large amount of refuse into the sea. The invitation is for this Saturday at 8 a.m. in the area surrounding the El Indio stream. The usual cleanup efforts will also be taking place in the Riviera Nayarit’s micro-destinations: La Cruz de Huanacaxtle (La Manzanilla), San Pancho and Sayulita in Bahía de Banderas; La Peñita de Jaltemba and Playa Platanitos in Compostela, as well as in the Isla de Mexcaltitán and Boca de Camichín in Santiago Ixcuintla. The Punta Mita Foundation along with Tron X will focus on cleaning the Playa Palito Verde starting at 10 a.m.
Of note is the first-time participation of the Hotel W Punta de Mita, as well as the constant support of Nuevo Vallarta’s Hard Rock Hotel Vallarta, the Palladium in Punta de Mita and Tropical Incentives from La Cruz de Huanacaxtle. In the meantime another cleanup is being organized for the Islas Marietas National Park, which will take place before the summer vacation season. 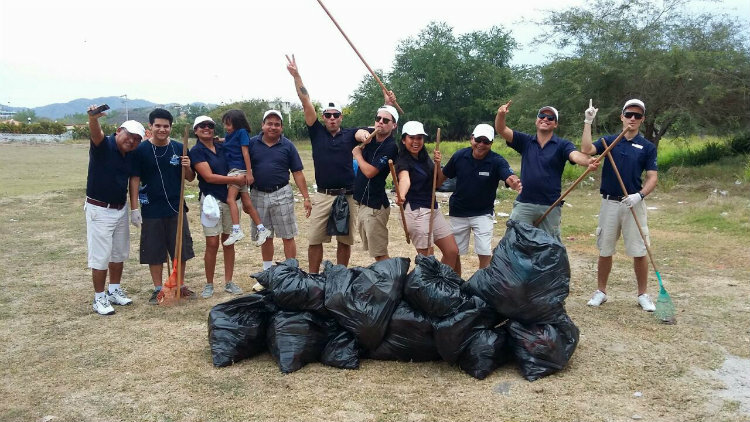 Every month the Riviera Nayarit CVB hands out approximately 21 boxes of trash bags in different sizes for a total of over three thousand bags. They also hand out gloves for hygienic purposes, rakes and brooms.